Today is Secret Recipe Club Reveal Day! 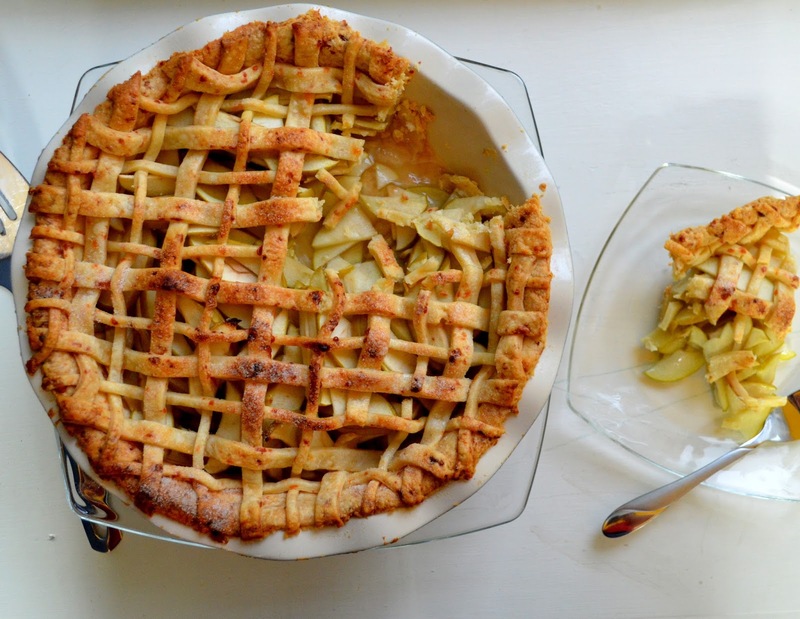 I've made a Cheddar Cheese Apple Pie to share with you from my assigned website. There are two different groups of people (three really but we won't talk about the third :) ), the ones who love cheddar cheese and apple together, and the ones who haven't ever heard of it or tried it. That second group? They should really give it a whirl because it's a great combination! This month I was assigned to Cooking in Stilettos. Aly's tagline is "Making the leap from Louboutin to Le Cruset" which is pretty great if you ask me. She has so many great recipes posted on her site that I wanted to make. You should check out her recipe index here. Ultimately, I decided on the Cheddar Apple Pie of course and I'm glad I did because it was really good. At first I thought that the cheddar was going to be mixed into the pie but it wasn't, it was mixed into the crust! The beautiful golden crust with actually flecks of gold from the cheese made the presentation of this pie beautiful. 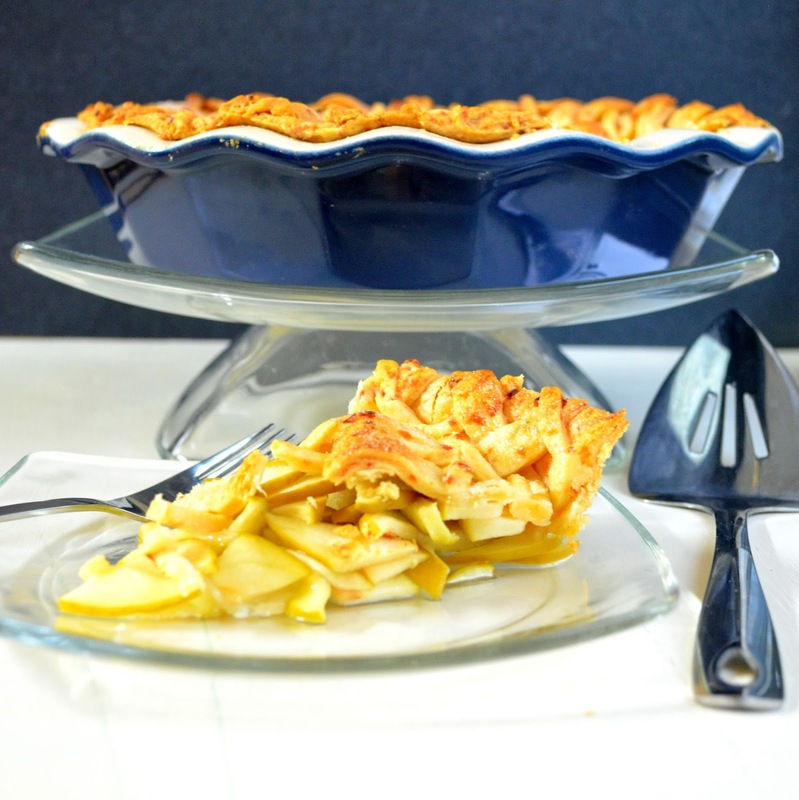 If you aren't sure about if you want to try this recipe for the Cheddar Apple Pie or not, you definitely should! I will say also that the original recipe uses Golden Delicious apples and I used Granny Smith apples instead because I believe they bake better and don't become as mushy after baking. Happy Baking everyone! 1. For the Crust: Mix the flour, sugar, and salt in a food processor, then pulse for 5 seconds. Add the butter and pulse the dough until it is about the size of peas. Add the cheddar cheese and pulse for 5 seconds until the cheese is mixed into the flour mixture..
2. Add one tablespoon of water at a time through the feeder, pulsing for 2-3 seconds in between. If the dough becomes too dry, add ice water, one tablespoon at a time. Do not overmix the dough in the food processor. 3. Divide the dough in half and flatten each piece into a disk, wrap with cling wrap and place in fridge for at least an hour. 4. For the Filling: Preheat the oven to 400 degrees F. Mix the cornstarch and the sugar in a large bowl, ensuring that there are no lumps in the cornstarch. Add the sliced apples, lemon juice, lemon zest and salt to the cornstarch mixture and toss together. 5. Assembly: On a large LIGHTLY floured workspace, roll out one of the disks to a 13-inch round. 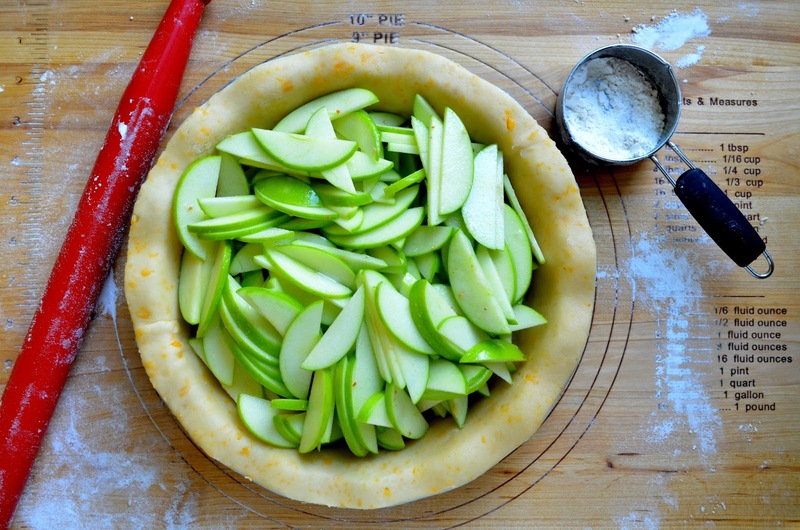 Gently fold the dough in half and transfer to a 9-inch deep pie plate and brush the dough hanging over the edge with water. 6. Pour the filling into the dough-lined dish and dot it with the 2 tablespoons of butter. On the same LIGHTLY floured surface, roll out the second disk into a 12-inch round. 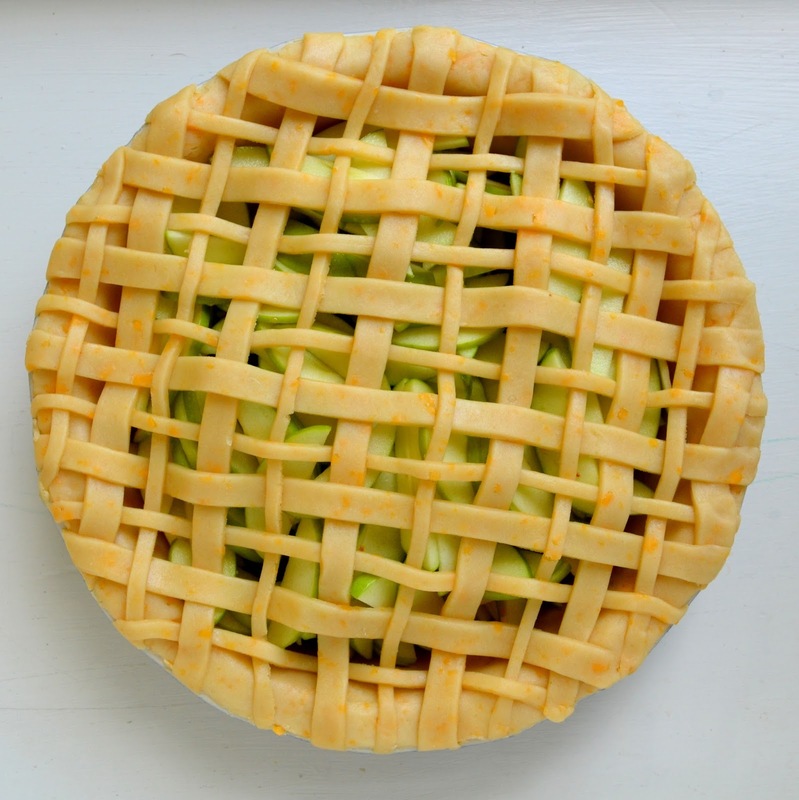 Place the dough on top of the filling and press the dough overhang from the bottom and top pieces to seal (or cut the dough into strips and arrange them into a lattice design). Cut the overhang to 1/2 an inch. Fold the overhang over and crimp decoratively. 7. Cut a small decorative "X" in the center and fold corners back to allow the steam to escape. Lightly brush the top of the pie with an egg white whisked with 1 tablespoon ice water and dust lightly with the turbinado sugar. 8. Bake until the pie is golden brown, about 30 minutes. Cover the crust edge with foil and turn the oven temperature to 375 degrees. Continue baking the pie until the filling thickens in the center, about 30 minutes. Cool pie on rack for an hour.